On November 22, millions of boxing fans from around the world will be tuning into their television sets as Manny Pacquiao of the Philippines and Chris Algieri of the United States lock horns inside the squared ring at the Cotai Arena in Macao, China. At stake will be the World Boxing Organization's welterweight championship belt. With the fight just less than two weeks away, HBO Sports is flexing its marketing muscles to hype up the match. Pacquiao-Algieri is a fight that is a bit more difficult to sell mostly because not many people know Algieri. The American boxer burst into fans' consciousness just a few months ago in June when he upset Ruslan "The Siberian Rocky" Provodnikov in a bloody battle of guts at the Barclays Center in Brooklyn, New York. In a preview of the upcoming match that recently aired on HBO, Algieri said that he's ready and he's confident that he will secure the victory come November 22. He added that he can beat Pacquiao because of his "competitive advantage". It's to be expected that Algieri will enter the ring against Pacquiao as a heavy underdog. Pacquiao is just coming off two very convincing wins against two big names in the sport - Brandon Rios and Timothy Bradley. This is not to mention the fact that Pacquiao has heavier hands and he is way more experienced. Pacquiao has fought 63 professional bouts compared to Algieri's 20. Algieri is undefeated as a professional boxer. His biggest win to date was the split-decision victory he earned with his gutsy performance against the wild and powerful Provodnikov. Some people contest Algieri's win over Provodnikov and no one can blame them. It was a very close fight and the decision could have gone either way. One thing's for sure though, you can question Algieri winning the contest but you can't question the way he fought in that fight. The way he survived two brutal knockdowns in the very first round. The way he rallied to get back into the fight with one of his eyes completely shut and swollen. 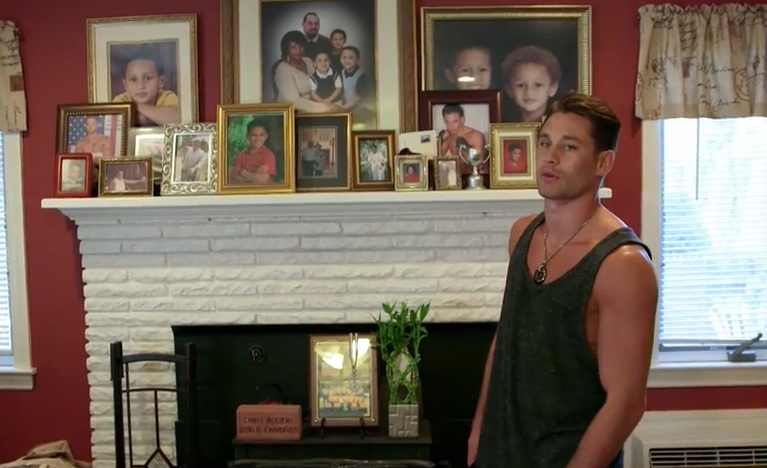 Algieri in his family's home in Huntington, New York. Photo: HBOsports via YouTube. In the preview for the fight aired by HBO, fight fans got to see how Algieri segued into boxing after getting disappointed with the way professional kickboxers are getting paid.